The Common eland is native to a number of African countries & is found in numerous national parks & reserves including in Ethiopia, Lesotho, Malawi, South Sudan & Swaziland. In southern Africa the Common eland lives on the open plains & prefer to live in semi-arid areas with shrub-like bushes (NZG; 2015). 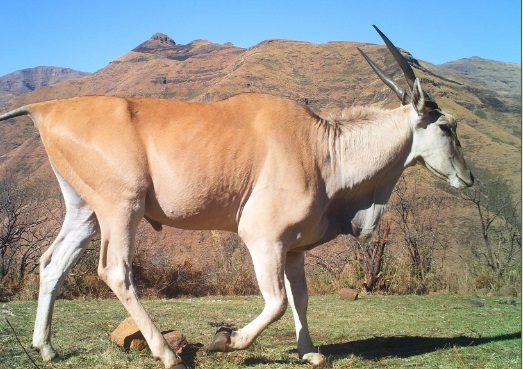 There are three subspecies of the common eland namely the Livingstones Eland, the Cape Eland or the East African Eland. The Eland residing within the Ts’ehlanyane National Park are Cape Elands, which can be identified as the only subspecies whose adults bear no stripes. Their coat is smooth with a rough mane; females having a tan coat & males a darker coat with a bluish-grey tinge which are often slightly larger than females (NZG; 2015). Males have thick fur on their foreheads & a dewlap on their throats. 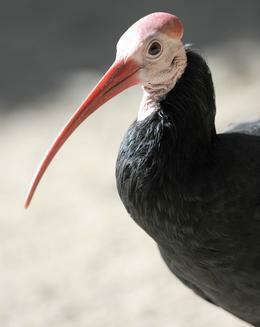 With maturity, Males’ coats become greyer & their faces become darker. Spiral horns can be found on both sexes & are used for protection, fighting & sourcing food. The horns of the females are generally longer with a tighter spiral compared to those of the males which are normally thicker & shorter (NZG; 2015). 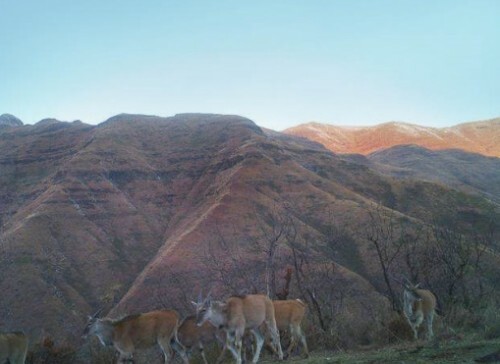 In very hot weather it is typical for elands to sleep long hours during the day and feed during the night. During colder seasons they are likely to be seen enjoying some sunlight in larger groups. 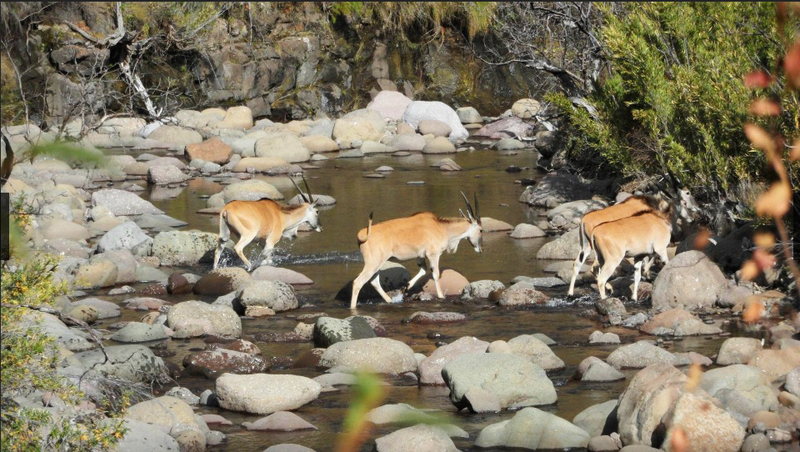 The Common eland is the slowest antelope, with a peak speed of only 40 km an hour over a short distance (NZG; 2015). 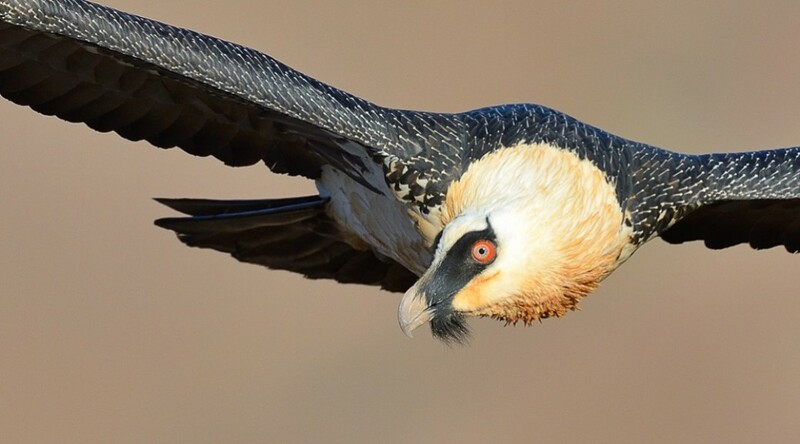 The males, females & juveniles form separate social groups, with the female groups being the largest. Generally, the life expectancy of Common eland is between 15 and 20 years, however in captivity some can live up to 25 years (NZG; 2015). 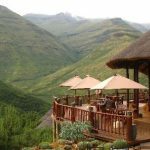 Maliba Lodge proudly shares the Ts’ehlanyane National Park with over 30 spiral-horned Eland, the second largest antelope in the world, slightly smaller than the Giant eland. The name ‘eland’ is Dutch for ‘elk’ or ‘moose’, named by the Dutch settlers after the moose found in the northern forests. The Eland were released into the National Park on 10 October 2008 & this was followed by another release which took place on 29 November 2009. 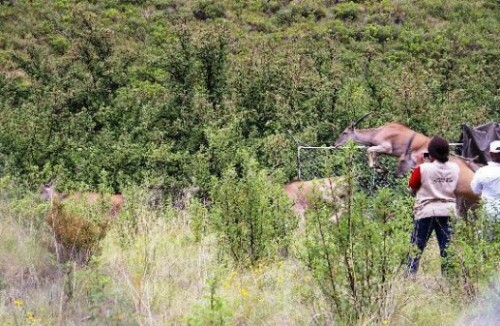 The Eland were trans located with the help of SANParks Veterinary Wildlife Services Team on the instruction of the Minister of Environmental Services from South Africa. 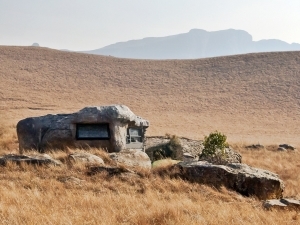 They were brought from a National Park located in Kimberley & in order to ensure a calm translocation, young non-pregnant females & non-territorial males were selected to be released into the Ts’ehlanyane National Park. The population of Eland now residing in the Park have adapted well to their new habitat. South Africa is privileged to have a variety of San/Bushman rock art paintings most of which depict the eland, the animal most depicted in rock art. 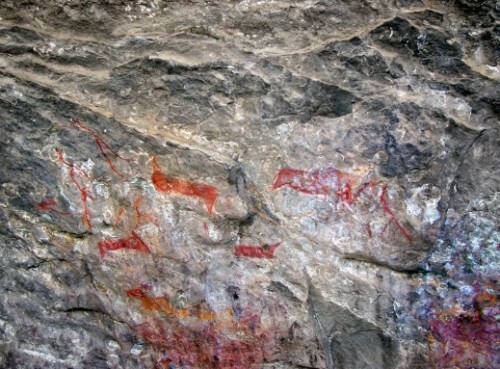 The Liphofung “place of the eland” caves in Lesotho, a 1.5 hour drive from Maliba Lodge, occupies an important place in Lesotho history.Originally used by the San and other Stone Age people, the walls contain ancient rock art depicting the eland which once roamed the area. Today the eland still occupies an important place in the traditions & mythology of some southern African tribes (NZG; 2015).